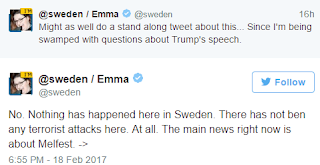 DemoCurmudgeon: Trembling Trump frightened by "...what's happening last night in Sweden!" 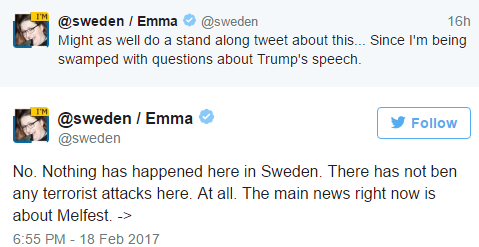 Trembling Trump frightened by "...what's happening last night in Sweden!" 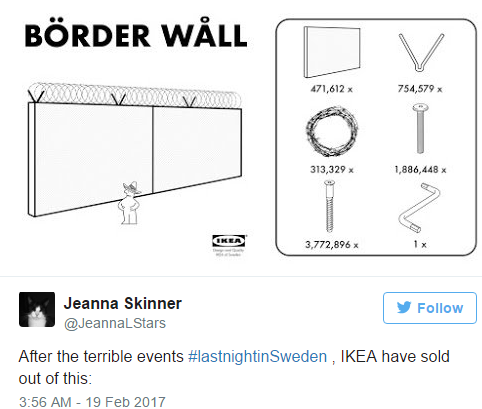 Sweden has no idea what Trump meant when he said, ‘You look at what’s happening … in Sweden:’ But if you believe President Trump, something happened in Sweden on Friday night that deserved the attention of the world. 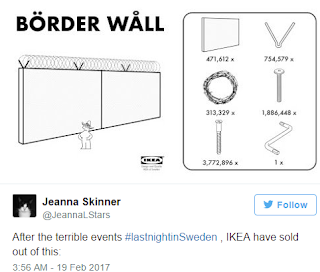 However, nobody knows what that might be so far, least the Swedes. 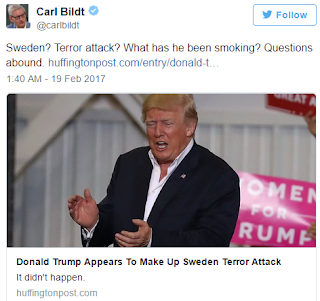 The White House already faced criticism this month after it included an incident in the Swedish city of Malmö on its list of allegedly underreported attacks. In October, arson caused smoke damage at an Iraqi community center in Malmö. A judge, however, decided that there was no evidence for treating the incident as a “terror attack” — months before the White House released the list that referred to the incident. Worst Skier Ever? You would be too. Great Story. Trump not fooling all the people...yet! McCain attacks Trump in speech to World. Walker wants Government Run State Self-Insurance? DeLusional DeVos DeVoid of DeSmarts. Trump making America Discriminate Again!